Asthma is characterized by dryness in lungs as a result of loss of sukra from the body. This hampers the normal supply of air, leading to respiratory disorders. The book, ‘Sanatan Kriya, the Ageless Dimension’ details the causes for loss of sukra from the body and provides techniques to prevent it and also for increasing sukra production in the body. In this article, we will be discussing certain techniques from the book, to tackle the specific condition called ‘asthma’. When the allergens irritate the lungs, our body secretes certain anti-allergens as a natural defense mechanism. Below are certain asans through which these secretions can be directed to the lungs effectively. It is recommended that you visit a Dhyan Foundation center near you to learn the correct way to practice these asans. Start by paying reverence to the energy of the Guru and Lord Ganesh. Bhoonaman Asan: Clench your fists and with the help of your knuckles and knees slowly go down on your belly. Allow only the knees, knuckles and forehead to touch the ground. Stay in the pose for as long as possible. Repeat this seven times. For the lungs to function at their optimum level, one needs to optimize the expansion and contraction of abdomen by maximizing the movement of diaphragm. This reduces pressure on lungs while optimizing its efficiency. This might seem technical; however it is so simple that even a newborn baby knows the trick. Sanatan Kriya details the Ujjai Pranayam to achieve this. Close your eyes and sit in vajrasan with your back straight. While inhaling, expand the stomach [diaphragm is pushed downward] and on exhaling, contract it [diaphragm is pulled back up]. Keep your awareness on the breath. Produce a gentle hissing sound from the pit of the throat as you exhale. This is Ujjai Pranayam. Breathing in ujjai, has the twin effect of first heating and then cooling the body. In the process, all the impurities are killed, and the entire body including the lungs gets revitalized. While optimizing the functioning of the lungs, the practice also acts as a purification process. This can be practiced while keeping the back straight, whenever the stomach is empty and one is in a clean environment. When the weather is changing, the environment is full of allergens and these allergens often contribute to problems like asthma and for an asthmatic, aggravate the problem. 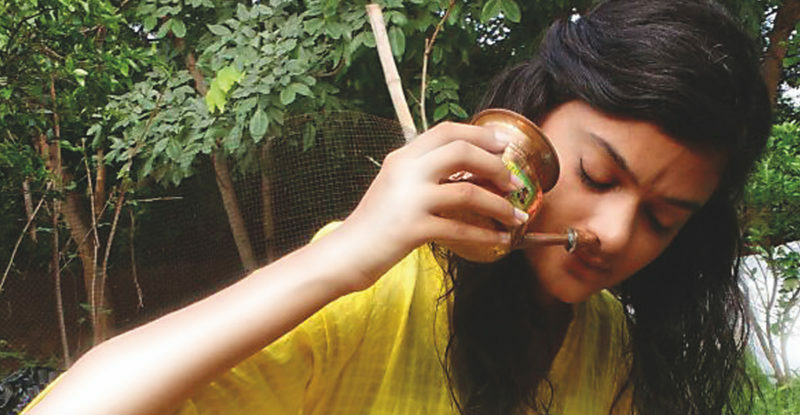 An effective technique to prevent allergens from entering the body is Jal Neti. Take 500 ml of bearably warm water in a neti pot, add half tea-spoon black/rock salt and a pinch of turmeric. Stand evenly, bend slightly forward and tilt the head at an angle of 45 degrees towards the left. Insert the nozzle of the pot into the right nostril. While breathing from the mouth, tilt the pot so that the water flows into the right nostril and flows out of the left. Repeat on the other side. Breathe normally afterwards. Saline water is the best cleansing medium, which absorbs and scrapes away infectious pathogens accumulated in the nasal passage. Turmeric is a disinfectant, antiseptic and scouring agent. This can be followed by putting warm pure ghee (made out of cow’s milk) to a bearable temperature. Lie down flat on your back and let the head hang down, bending the neck backwards. Using a dropper or spoon, pour about 5 drops of ghee in each nostril in a way that it does not flow down towards the throat but back towards the head. Keep lying in this position for 5 minutes. Ghee lubricates the nasal passage and strengthens the mucous membranes against infections. Take 1 year old pure desi cow ghee. Put 6 black pepper corns in it and leave overnight. Next morning put 1/8th tsp of this ghee in each nostril, position of the head should be such that the ghee does not flow back into the throat. This medicated ghee helps in making the allergen ineffective and then it can be thrown out of the body for which gently inhale and as you are exhaling bring your head down by bending the neck, without giving any jerk. Another effective remedy to clear out allergens from body involves adding a pinch of saffron to one year old pure and organic honey (preferably single flower honey). Leave the mixture overnight and have it next morning. All of these techniques are tried and tested for thousands of years by the vedic masters, and in present times by sadhaks at Dhyan Ashram. It is highly recommended that one does not perform them by reading from books or on television, but practice them under the guidance of a Guru.